Systemic lupus erythematosus (SLE) is a systemic autoimmune disorder affecting predominantly the young women characterized by multiorgan dysfunction and production of multiple autoantibodies. Myasthenia gravis (MG) is an organ-specific autoimmune disease characterized by dysfunction of the neuromuscular junction mediated by autoantibodies against the nicotinic acetylcholine receptor, the muscle-specific tyrosine kinase, or the low-density lipoprotein receptor-related protein 4, resulting in muscle weakness. SLE can precede or follow the development of MG. Coexistence of SLE and MG is a rare phenomenon, and sporadic clinical cases had been reported. We describe one such patient who developed MG while on treatment for lupus nephritis. A 38-year-old female presented on March 2016 with breathlessness, oliguria, and edema of 1-week duration. She had polyarthritis on and off for 1 year and was diagnosed to have SLE, established with 4 out of 11 criteria of the American College of Rheumatology. She had a significant obstetric history of intrauterine death at 22 weeks during her second and third pregnancy, with histopathology of placenta showing a large area of placental infarct (25%) and normal umbilical vessels. Her blood pressure was 160/100, and peripheral edema was present. Laboratory investigation showed urinalysis: 3+ proteinuria, plenty of red blood cells; spot urine protein creatinine ratio: 8.6; blood urea: 88 mg/dl; serum creatinine: 6.4 mg/dl; serum C3:21 mg/dl; serum C4:5 mg/dl; serum antinuclear antibodies, and anti-ds DNA: positive. Anticardiolipin and antiphospholipid antibodies (APLA): negative. Ultrasonogram of the abdomen showed normal-sized kidneys. 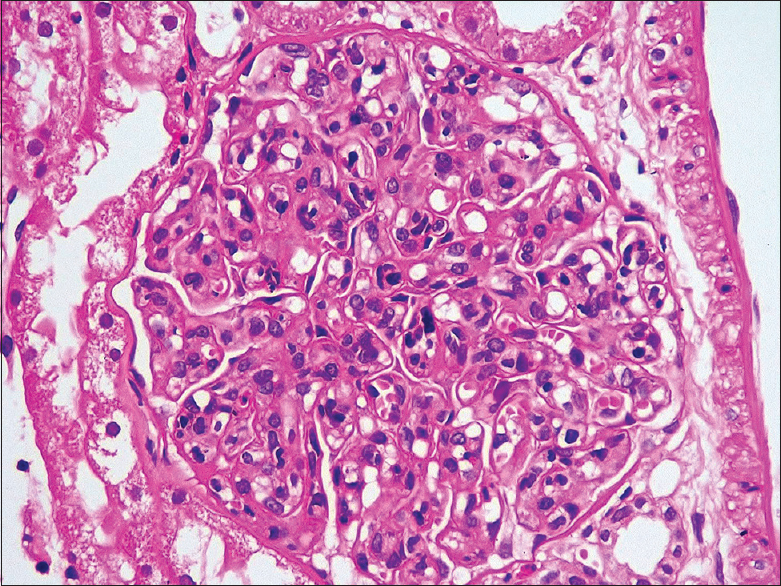 Renal biopsy showed eight glomeruli with endocapillary proliferation and lobular accentuation of the capillary tuft [Figure 1]. Early cellular crescents were identified in two glomeruli with fibrous intimal proliferation of the arteries. Immunofluorescence was positive for IgG (+3), IgM (+2), IgA (+1), C3 (+3) over capillary walls and mesangium suggestive of diffuse profilerative glomerulonephritis, lupus nephritis (ISN/RPS Class IV – A). She was treated with pulse methylprednisolone 1 g/day for 3 days, followed by oral prednisolone 60 mg/day for 8 weeks and monthly intravenous cyclophosphamide 500 mg. In addition, she also received hydroxychloroquine (HCQS) 200 mg once daily and antihypertensives. She had dialysis-dependent renal failure for 2 months and was on twice-weekly hemodialysis (HD). At 3 months after onset of renal failure, she developed difficulty in opening both the eyes. Her blood pressure was 150/100 mm Hg. Neurological examination was normal except for bilateral eye ptosis [Figure 2]. Oral HCQS was stopped, and there were no improvement even after 1 week of discontinuing this drug. The cerebral contrast-MRI and chest X-ray were normal. Serum creatinine kinase was 140 U/L. Nerve conduction studies showed the decremental response of 15%–25% over facial muscles with no decremental response over limb muscles. The findings were consistent with neuromuscular junction disorder. Anti-AchR antibody was negative. She was treated with oral pyridostigmine 60 mg twice daily. Clinical improvement was seen within 48 h. Her renal failure also slowly improved and she was dialysis independent after 4 months of HD. Mycophenolate mofetil therapy was started at a dose of 1000 mg/day orally as a maintenance therapy for lupus nephritis along with oral prednisone after 6 months. Till the last follow-up, recently, her serum creatinine was 1.41 mg/dl with no recurrence of ocular symptoms. SLE is an autoimmune disease mainly involving the skin, joints, kidneys, serosa, lungs, heart, and the nervous system. In a retrospective study of 215 patients with SLE, 30% of patients had another autoimmune disease, Sjogren's syndrome being the most common. MG is a chronic autoimmune disease characterized by fatigue and proximal muscular weakness, which results from immune-mediated destruction of acetylcholine receptors at the neuromuscular junctions. SLE can precede or follow the development of MG. The prevalence of SLE in MG was 2.2%–8.3% and the prevalence of MG in SLE was 1.3%. The presence of ocular symptoms, persistence of ptosis even after HCQS withdrawal, and nerve conduction findings suggestive of MG prompted us to diagnose MG despite the negative AchR antibody. We started on oral anticholinesterase agents and had good clinical improvement in our patient. HCQS has a long half-life of few months and hence stopping it for 1 week may not exclude the possibility, but she had dramatic response to pyridostigmine which is more likely of MG. HCQS-induced neuromyotoxicity and myopathy usually presents with symmetrical and proximal muscle weakness and pure ocular involvement is very rare as in our patient. Although the prevalence of AchR antibodies is 80%–90%, it is only 50% in ocular myasthenia; hence, the absence of anti-AchR antibodies does not rule out MG. Some peculiarities in our patient were that MG developed in lupus nephritis patient (only 18% of published cases had renal dysfunction), had negative anti-AchR antibodies (94% positivity in published cases), and anticardiolipin antibody and APLA were also negative (56% positive in published cases). In conclusion, the association between SLE and MG is complex. In MG patients who had undergone thymectomy, any clinical and serological suspicion of SLE should be carefully evaluated. In lupus patients complaining of decreased muscle strength and fatiguability, the possibility of MG should be ruled out. We would like to thank Dr. Anila Abraham Kurien MD, Director, RENOPATH, Chennai, for her help in the evaluation of renal biopsy. Zhang B, Tzartos JS, Belimezi M, Ragheb S, Bealmear B, Lewis RA, et al. Autoantibodies to lipoprotein-related protein 4 in patients with double-seronegative myasthenia gravis. Arch Neurol 2012;69:445-51. Sîrbu E, Milaş O, Petrica M, Petrica L. Systemic lupus erythematosus followed by myasthenia gravis: A rare association. Cent Eur J Med 2013;8:799-802. McDonagh JE, Isenberg DA. Development of additional autoimmune diseases in a population of patients with systemic lupus erythematosus. Ann Rheum Dis 2000;59:230-2. Castrejón I, Shum K, Tseng CE, Askanase A. Association between myasthaenia gravis and systemic lupus erythematosus: Three case reports and review of the literature. Scand J Rheumatol 2011;40:486-90. Vinagre F, Santos MJ, Silva JC. Systemic lupus erythematosus with muscle weakness due to myasthenia gravisActa Reumatologica Port 2006;31:167-72. Jallouli M, Saadoun D, Eymard B, Leroux G, Haroche J, Le Thi Huong D, et al. The association of systemic lupus erythematosus and myasthenia gravis: A series of 17 cases, with a special focus on hydroxychloroquine use and a review of the literature. J Neurol 2012;259:1290-7. Park MJ, Kim YA, Lee SS, Kim BC, Kim MK, Cho KH, et al. Appearance of systemic lupus erythematosus in patients with myasthenia gravis following thymectomy: Two case reports. J Korean Med Sci 2004;19:134-6. Sthoeger Z, Neiman A, Elbirt D, Zinger H, Magen E, Burstein R, et al. High prevalence of systemic lupus erythematosus in 78 myasthenia gravis patients: A clinical and serologic study. Am J Med Sci 2006;331:4-9. Hostmann A, Jacobi AM, Mei H, Hiepe F, Dörner T. Peripheral B cell abnormalities and disease activity in systemic lupus erythematosus. Lupus 2008;17:1064-9. Kigawa N, Pineau C, Clarke AE, Nashi E, Vinet E, Veilleux M, et al. Development of myasthenia gravis in systemic lupus erythematosus. EJCRIM 2014;1: Doi: 10.12890/2014_000020. Banica L, Besliu A, Pistol G, Stavaru C, Ionescu R, Forsea AM, et al. Quantification and molecular characterization of regulatory T cells in connective tissue diseases. Autoimmunity 2009;42:41-9. Casado E, Gratacós J, Tolosa C, Martínez JM, Ojanguren I, Ariza A, et al. Antimalarial myopathy: An underdiagnosed complication? Prospective longitudinal study of 119 patients. Ann Rheum Dis 2006;65:385-90. Mai W, Liu X, Fan Y, Liu H, Hong HY, Han R, et al. Up-regulated expression of fas antigen in peripheral T cell subsets in patients with myasthenia gravis. Clin Invest Med 2012;35:E294. Meraouna A, Cizeron-Clairac G, Panse RL, Bismuth J, Truffault F, Tallaksen C, et al. The chemokine CXCL13 is a key molecule in autoimmune myasthenia gravis. Blood 2006;108:432-40.